Yesterday, Muzz & I headed up the Lima valley to the Natural Reserve of “Orto Botanico” just below the ski resort of Abetone on the ridge of the Appennino Tosco-Emiliano, in the province of Pistoia. Our target today was the wonderful Lago Nero, nestled below the grand Alpe Tre Potenze. 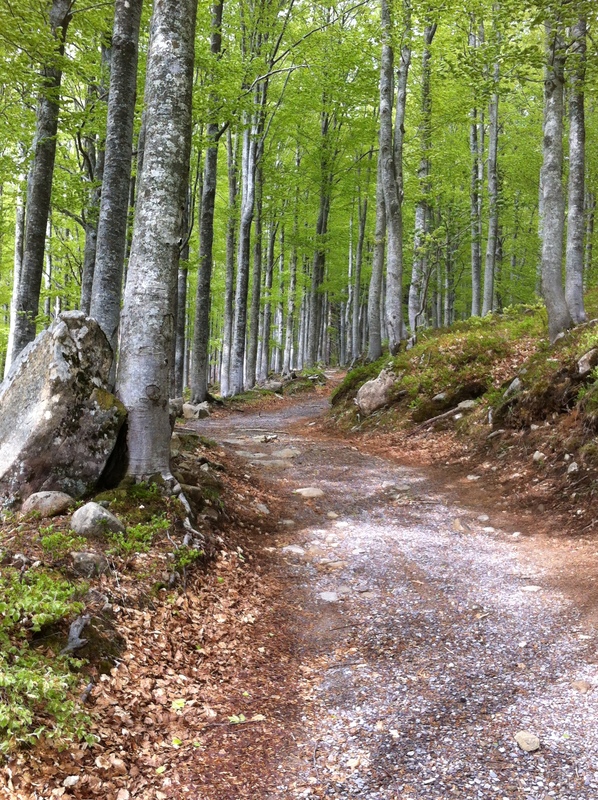 The walk is an easy inclined path amongst typical Italian beech forest with the brightest green leaves on mottled silvery grey trunks surrounded by a base of dappled copper, leaf detritus. The sunlight was kind to us, shot through the trees creating wonderful uphill vistas throught the knotted, twisted trunks. After about 1.5 hours of steady ascent,we reached Lago Nero and the Rifugio, now closed and only open to those members of the Commune di Modena, a shame really as these Rifugio’s now offer no protection to those hikers in need of shelter in times of adverse weather or a meal on their journey. In addition, the lack of active management means that the remnants of peoples fires, barbeques and the usual rubbish that comes with this, is evident. Apart from this one negative aspect, the location is magnificent. 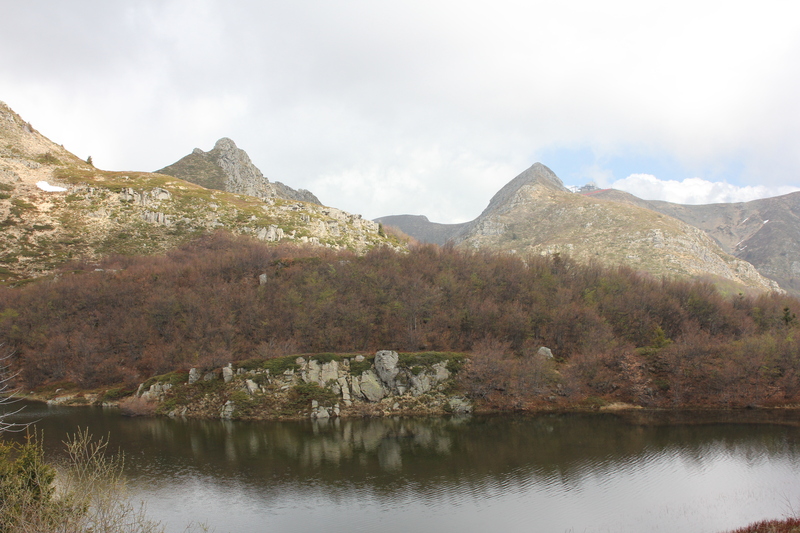 The lake is indeed black due to its location on a north facing mountain and shaded from its protector, Alpe Tre Potenze. Muzz is going to trace an alternative route back down from here through Belevedere to reach Le Regine, the end of the “B” party’s walk. Whilst I glance across Lago Nero and take in my targets of Denti della Vecchia “the old teeth”, La Fariola (the highest peak in my view @ 1894m) and Monte Gomito (1892m) with it’s ugly Ski station perched on top and slashes of bright red, plastic ski netting, like a scar visible from afar. I was excited about scaling the “old teeth” as it formed quite an impressive ridge between the two passes of Passo della Vecchia and Passo della Fariola. It was as equally impressive once on it, as it appeared from across the lake. Once across Denti della Vechia, my original plan was to skirt around La Fariola, which towered above it’s namesake pass, taking the famous CAI 00 path but, the temptation to scale the near vertical face (in parts) took hold of me and off I climbed. The view from the summit was suitably rewarding looking back at the dragonlike spine of Denti della Vecchia and the other way to the final summit of Monte Gomito. The wind, since leaving the sheltered lake had picked up and served to try and whip me off the top of La Fariola, coming directly from the North East it was bracingly chill too. The path from here was gentle, almost flat and on reaching Monte Gomito the wind was at its most ferocious, racing up the lines of the Gondola, howling around the cableway stanchions and across the edge of the platform. The valley opening down below to the bowl of Abetone, some 600m below me. I’m glad that the wind wasn’t behind me! After Monte Gomito I made my way down the slope heading for Rifugio Selletta, which is my only reference point as the CAI, GEA or MPT signs are non-existent and only reappear long after Rifugio Selletta, after guessing which path was the correct one, guided by the direction of the ski lifts. I’m back on the CAI 00 path, winding my way down a fairly steep ridge above the bright red seats of the chair lift to my right and a fairly open cliff to my left, which may leave those that suffer vertigo, feeling slightly light-headed. After approx. 1 hour of descent, I reach Abetone feeling pleased that it’s still only 1.30pm. Time for a spot of lunch whilst I wait for Muzz to pick me up after finishing his part of the walk. I thought he might be here before me! Sounds like a wonderful day !